I've never done any Android code. But have done iPhone both in xcode and mono, and windows development is what I do full time. I'm sure I can Google this, but what tool do you use to build your sources on github? Thought there may be multiple options for Android dev so I was curious which you work with. Pretty much one options from Google - the Android Studio IDE with Gradle build system. I highly recommend this book to anyone starting with Android dev - recently updated with the 2nd edition, which is incredibly important as the Android development scene grows and changes rapidly (i.e. the tools and frameworks from 2 years ago are mostly irrelevant today). Heck, some of the stuff in there is already slightly outdated. Anyway, yeah, I'm in the process of overhauling everything backend/storage related. Cool and thanks! I'm not *that* interested, just maybe enough to download the code and fix the crash for myself until the update... I shouldn't need a book for that. Any estimate on the next release? I don't know why but my entire 3x3 history got deleted.I don't know whether the problem is from my side or the timer. 6.Can you add an option to pre-generate scrambles?What I mean to say that when the user is timing you can generate scrambles for other puzzles in the background, save them in a file,and when the puzzle to selected just load the scramble from the file. 7. (I was just checking GitHub after posting and realized) A interactive graph would be nice. Just one more.Any chance of a PC version?? Just released 0.3.0-beta2 - click here to opt-in/opt-out of Google Play beta-testing. This marks the 3rd time I'm rewriting the storage system (specifically JSON: 0.2.4 > SQLite: 0.3.0-beta1 > Firebase: never released > CouchDB: beta2), but I'm think I'm finally happy with this one. The syncing and backend features are very robust - this beta lays the groundwork for sign-in and backup. I haven't written the code to import the solves from the old system, but they will remain on your device until I do so (i.e. don't erase data!). Some other features are also not re-implemented yet (off the top of my head, BLD is a bit wonky and long-press multi-select is not done), but user-experience wise not much has changed. TNoodle is updated to 0.11.0, and there is an improved graph with interactive zooming. Now that the hard part of the update is done, I'll be focusing on feature and UI improvements. If you choose to participate in this beta test, please do send me any bug or crash reports, as well as feature suggestions! Database re-write specifically for fixing the instability of the old system Please do try the beta! I've actually been thinking about this and how to implement it with a good UX - I think I finally have a good idea, so this will be implemented soon. The syncing solution will make this less applicable, but yes, on the todo list. All on the todo list - I'll be implementing many of these for 0.3.0 and subsequent updates. I don't want to waste battery generating scrambles for puzzles that the user may or may not use - but currently, the app generates the next scramble for the current puzzle when the user is timing. I might implement a larger buffer - e.g. 5 pre-generated scrambles instead of one. I've been looking into web development as well as iOS. Those will definitely make the syncing solution much more useful. Awesome I downloaded it, I'm very excited! Just released 0.3.0-beta2 ............. Thanks for all the suggestions! Great timer, have around 2000 solves in different events on there but have a few additions I'd love to see. 1. Could you as a Mo3 statistic? It's useful for big cubes and my PB spreadsheet! 2. I sometimes use stack mat and enter the times in manually by editing the time in seconds. If you could either add a function to type in times or maybe have it so you put in the times as Minutes and seconds rather than raw seconds, I have to put 6x6 solves in as 200 or so seconds! Agree on manual times for the stackmat, that would be great! Timer is awesome, I love the smoothness with which it works. A suggestion: I would love to see subset scrambles like roux block, cfop last layer, OLL PLL and all that stuff. There goes my 2000+ solve session. It may still be on your storage. ?? So far i love this timer. It works really well. I would like it if it had an option to be able to customize it to accommodate for multiple 3x3x3 cubes. Since i go back and forth between various cubes it'd be nice to be able to make sub folders in each category so i dont get the times for each cube mixed up. @plusCubed, I love your timer. could you make it so that the speed stacks timer could connect to the device and input the scores into the app while you run the speed stacks timer? maybe in conjunction with some sort of adapter through the usb port or something. how could you do that? 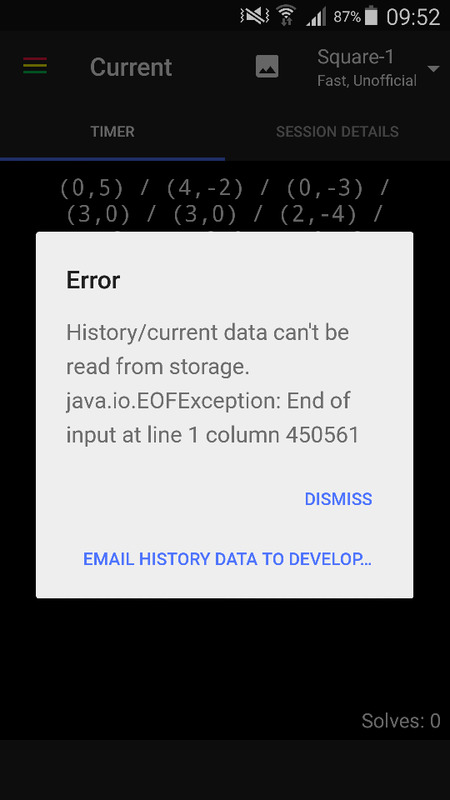 I've never messed with android studio before for android development, but i tried importing the source code for plusTimer to mess around with it, and i cant get the code to build and run on my device. Is there any specific android studio version i need to be using to get this to work? So... it's been a while. First things first - https://timer.pluscubed.com. What do you think? It's definitely still a work-in-progress, but eventually, this will replace the Android app. In my opinion a customizable buffer could be the best solution and this settings could be tucked away into a 'Advanced' Tab. One downside is that a web version can't use TNoodle. On the upside, it's still random-state and seems to be much faster. If I find the time, I might update the Android app to fix some of the more egregious bugs as I continue working on the web version. I honestly haven't opened the Android code in quite a long time. A lot of the dependencies are probably out-of-date.